Cognitive Restructuring is a simple but powerful technique for identifying and undoing negative thinking patterns like worry and rumination. Do you often find yourself “stuck in your own head,” caught in endless spirals of negative thinking? Maybe it’s an overly-judgmental inner voice that constantly points out past mistakes and perceived faults. Or maybe it’s perpetual worry about the future and comparison to other people. For many of us, negative thinking patterns are the source of tremendous emotional suffering and misery. In fact, they’re the key drivers of both depression and anxiety. And while negative thinking can feel completely automatic and outside our control, with the right practice and techniques, you can learn how to re-train your mind’s habitual way of thinking and free yourself from the burden of negative self-talk. In this guide, I’ll guide you through exactly what Cognitive Restructuring is and what it looks like, including 10 of the most powerful benefits that come from practicing it. Then we’ll walk step-by-step through the process of using Cognitive Restructuring yourself to identify, modify, and ultimately free yourself from your own negative thinking patterns. Cognitive Restructuring is a core technique in Cognitive Behavioral Therapy, the most well-studied and effective approach to treating common mental health issues like anxiety and depression. 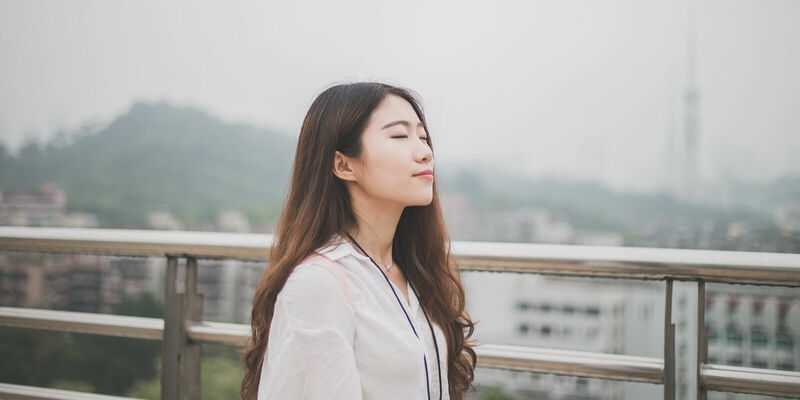 And while it’s often used to treat clinical disorders like anxiety and depression, Cognitive Restructuring can be just as useful to anyone who struggles with overly-negative thinking patterns and self-talk. Cognitive Restructuring is based on the principle of cognitive mediation which says that how we feel emotionally is not the result of what happens to us, but instead, it’s the result of how we think about what happens to us. This means that we can change the way we feel by changing the way we think about what happens to us. I was browsing Facebook one evening before bed and notice that my best friend had posted about how much funshe had had with another one of our friends earlier that day. I immediately feel sad and a little angry because I had just spent the previous day with her and had a great time but she didn’t post anything about our day. Before I knew it, I was thinking about all the reasons my best friend might not really be as good a friend as I thought and secretly want to ditch me as a friend. I had been perfectly happy all evening, and within 3 minutes, I was an anxious, despondent mess! What happened? Notice that it was the Facebook post triggered or set off the whole chain of events and bad mood. What were the initial thoughts? My client explained that as soon as she saw the Facebook post, two thoughts popped into her mind: Why didn’t she comment on our day yesterday? She must not have had as much fun with me. What were the initial emotions? She described feeling mostly angry at first, with a little sadness and fear mixed in as well. Can you come up with some alternative ways of thinking about what happened? Maybe she did post about our day together but I just didn’t see it because of Facebook’s algorithm. I didn’t post anything about our day together but that doesn’t mean I didn’t have a good time. Etc. How are you feeling now? After generating these alternative thoughts about what happened, my client explained that she was still a little upset, but definitely not as much. It helps us get organized mentally. Just like making a to-do list helps us feel more organized and less overwhelmed when we’re working on a big project, Cognitive Restructuring helps us feel better by getting our mental space better organized. It forces us to slow down. Every negative thought leads to a corresponding “dose” of negative emotion. If you can slow down your thinking and have fewer thoughts, you’ll end up with less emotion. It helps us be more aware. Thoughts and the emotional reactions they produce can happen quite automatically. Cognitive Restructuring helps us notice and become more aware of our mental habits, which is an essential step in eventually modifying them. It gives us a sense of agency and control. By noticing our default thinking patterns as just that, a default, and then generating new alternative thoughts, we change negative thoughts from something uncontrollable that happens to us to things we actually have a good amount of control over. It helps us think more clearly and rationally. By encouraging us to question and examine our initial line of thinking, Cognitive Restructuring helps us to see errors or mistakes in the way we’re thinking. As we’ll see in a later section, identifying Cognitive Distortions is a key ingredient in managing our negative thinking patterns and moods better. It helps us reflect instead of reacting. When we’re upset, it’s natural to just react—worry more, crack open another beer, distract ourselves with YouTube, etc. Aside from the negative effects that go along with some our favorite reactions to being upset (“empty” calories, wasted time, etc. ), by always reacting without reflecting, we deprive ourselves of the opportunity to better understand our minds and learn how they work. Which of course is important if we want them to run more smoothly. It breaks bad mental habits. We can get into mental habits (like worry, for example) just as easily as we can get into physical habits like twirling our hair or biting our lip. The key to breaking those habits is to notice when we start doing them and substitute a different behavior. Cognitive Restructuring does just that: it forces us to notice bad mental habits and replace them with better ones. These are just some of the mental skills that Cognitive Restructuring helps us to build. In the next section, we’ll look at some of the most common real-world benefits and results of using Cognitive Restructuring. As we discussed earlier, the concept of cognitive mediation tells us that how we habitually think profoundly influences how we habitually feel. The implication is that if we want to feel better on a regular basis, we need to figure out a way to change how we habitually think about and interpret what happens to us. And that’s exactly what Cognitive Restructuring teaches us to do—identify and modify our default ways of thinking about things to be more flexible and realistic. If we can learn to do this consistently, it will affect literally every aspect of our lives, because there’s no part of our life that we don’t think about and interpret. Whether it’s an argument with our spouse, worry about an upcoming interview, or grieving over a newly deceased family member, we tend to get stuck in automatic and rigid ways of thinking. By teaching us to be more flexible in our thinking, Cognitive Restructuring changes how we think about (and feel about) everything. A key driver of all anxiety issues, from Panic and OCD to Social Anxiety and Generalized Anxiety, is the mental habit of worry, which is when we irrationally anticipate future threats or dangers. Even though we may know on some level that our worries are irrational and leading to unnecessarily high levels of anxiety, the fact that worry is a habit makes it difficult to break out of and set down. Cognitive Restructuring is an effective way to identify when we’re engaging in the habit of worry and to disengage from it by calling out the irrationality of it and substituting more realistic thought patterns instead. Just like worry is a key driver of anxiety, rumination is a key driver in depression. Rumination is when we continually go over past mistakes and shortcomings in a judgmental and overly-negative way. If worry is irrational thinking about the future, rumination is irrational thinking about the past. And like worry, it can be difficult to break our habit of thinking about ourselves and our past so judgmentally and critically because it’s become a strong habit. Cognitive Restructuring can help us break out of ruminative depression spirals by helping us identify and modify depression-generating negative thinking patterns. Our ability to think critically, analyze and evaluate difficult challenges, and generally problem-solve is one of our greatest strengths. But left unchecked, this strength can become one of our greatest weaknesses. Like gears in a car, the problem-solving mindset is helpful in certain situations but unhelpful in others. Analyzing our performance during a recent sales call while we’re in bed trying to sleep, for example, is probably not working in our favor. And in fact, not being able to “downshift” out of problem-solving mode is one of the biggest sources of excess stress and burnout. Cognitive Restructuring can help us identify when problem-solving is and isn’t appropriate, and then get better at shifting out of that mode of thinking into a more relaxed mental state. And obviously, being able to relax is a great way to relieve stress and overwhelm. I subtle but powerful cause of procrastination is our own negative self-talk. While it’s completely normal and natural to get distracted from time to time, or even to put things off entirely for a period, what leads to serious forms of procrastination is the intense barrage of self-critical negative thinking we direct at ourselves because of those tendencies. On the other hand, the secret that most productive people know is that the occasional lapse or slip-up doesn’t necessarily mean anything and criticizing ourselves for it tends to lead to even greater, more harmful levels of procrastination and productivity loss. Cognitive Restructuring can help us procrastinate less and get more done by discouraging overly-harsh self-talk and thinking patterns. By re-framing the occasional lapse in attention and urge to procrastinate as natural, it’s often much easier to resist and return our focus to the task at hand. It’s an almost universally-acknowledge fact that relationships live or die based on our ability to communicate well—asking for what we want directly, saying no to what we don’t want, listening genuinely and empathetically, etc. What’s less well understood is that the way we talk to ourselves—our internal patterns of thinking—impacts our ability to communicate. If we’re constantly worried about upsetting our partner, it’s going to be difficult to assertively ask for what we want. When we use Cognitive Restructuring to improve our own self-talk, we simultaneously improve our ability to communicate honestly and respectfully. How many of our relationships wouldn’t benefit profoundly from that? While it’s important to think realistically about ourselves and the world around us, this doesn’t been we’re doomed to pessimism and a perpetually gloomy outlook. If you’ve ever wanted to be more optimistic in your general outlook on life—without swinging to the other extreme of being naive—Cognitive Restructuring can help. Specifically, when we learn to carefully examine and modify our habitual ways of thinking, we can catch overly negative and pessimistic viewpoints that normally would run unchecked. Whether your goal is to kick a destructive addictive behavior or stay sober and maintain your progress, mindset and self-talk play a crucial role. In particular, how we manage cravings can be especially influenced by our routine ways of thinking about the experience of craving and other addiction triggers. The mental mastery that comes from Cognitive Restructuring can make managing cravings and addiction far more doable. What’s more, by learning to achieve more control and agency over our thoughts and emotions, that same agency and control tends to extend to our behaviors. In other words, it’s easier to manage our actions when we’re skilled at managing our thoughts. Assertiveness is the ability to express ourselves in a way that’s both honest and true to ourselves but also respectful of others. But more than a way of communicating effectively, assertiveness really means a commitment to our highest values and being willing to pursue those values and goals regardless of how we may feel moment-to-moment. Unfortunately, our own self-talk and mental habits often lead us astray from our values and acting assertively. And as a result, our self-confidence erodes and our sense of self can become frail and brittle. Using Cognitive Restructuring to cultivate an assertive and robust internal voice is a fantastic way to begin speaking and acting more assertively. And as a result, increase our confidence and sense of self. For better or worse, our society and culture tend to emphasize and encourage judgmentalness: We hold ourselves (and others) to high standards and are quick to point out when those standards are not met. An under-appreciated way of thinking is what we might call the observing or appreciating mode. Rather than analyzing and critiquing everything, it’s possible to cultivate a mindset that acknowledges and observes in a non-judgmental way. This empathetic, compassionate mindset is especially helpful when it comes to our mental and emotional wellbeing. By learning to identify and modify overly judgmental and critical patterns of thought, Cognitive Restructuring can then help us shift into a more empathetic and compassionate style of thinking. One of the many problems with a mind constantly full of negative thinking is that it leaves no mental space for reflection and introspection. How can we thoughtfully consider our most important values or aspirations when we’re constantly worrying about the future or ruminating about the past? One of the most underrated benefits of Cognitive Restructuring is that it often frees up a surprising amount of “mental bandwidth,” and in doing so, allows us the space to reflect on deeper, more meaningful questions about ourselves. Now that we’ve talked a little bit about what Cognitive Restructuring is, what it looks like, and what some of the benefits are, it’s time to dive into the nuts and bolts of actually doing it. A quick note before we jump in: Like running on the treadmill or practicing scales on the piano, the power of Cognitive Restructuring comes from doing it consistently over time. Simply understanding it and doing it occasionally is not enough; for Cognitive Restructuring to have a meaningful effect on your life, it must be done consistently and become a habit. We’ll talk more about this later, but it’s important that you set your expectations realistically up front. What follows are the 6 basic steps to follow in order to do Cognitive Restructuring. Step 1: Hit the pause button. Cognitive Restructuring can be useful in many situations. But the best time to use it is when you notice that you’re feeling a strong negative emotional reaction to something, especially if your response seems out of proportion to what happened. An alternative is to use sudden, strong emotion as a cue or reminder to “hit the pause button” instead. Then, once you’ve briefly paused, ask yourself: What’s going on here? When we can inhibit our instinctive response to negative feeling and approach it with an attitude of curiosity, our chances of managing the situation intelligently go way up. Step 2: Identify the trigger. Once you’ve used sudden, strong emotion as a cue to pause, the next step is to identify what event triggered your response in the first place. A triggering event is often something that happens in our external environment: A coworker makes a sarcastic comment, our spouse gives us “the look,” a car cuts us off on the freeway, etc. But events in our internal environment—that is, in our minds—can also act as triggers: A thought pops into mind that we forgot to mention a critical idea during the meeting, a memory of a recently-deceased friend comes to mind, etc. Who is or was present with me at the time I got upset? Because we’re social animals by nature, people often play either a direct or indirect role in our emotional reactions. What happened? Literally, what sorts of things happened to me leading up to feeling upset? Remember that no detail or fact is too small to be influential. The trigger doesn’t have to be something big and obvious—in fact, often it’s something quite small and subtle. When did I first start feeling upset? What happened immediately before this? This question is particularly important if you’re doing Cognitive Restructuring hours or days after the fact. Where did it all occur? Often the initial triggers for becoming upset are a part of or connected with our physical environment. Step 3: Notice your automatic thoughts. Automatic Thoughts are our default, initial interpretations of what happens to us. They’re almost always spontaneous (i.e. we didn’t initiate them) and typically take the form of verbal self-talk or sometimes images and memories. For example, if someone cuts you off while driving, your automatic thought might be “What a jerk!” Or, if you see an email from your boss late at night, your automatic thought might be “Oh no! What’s wrong?! I must have forgotten something earlier.” Or perhaps seeing a billboard advertisement for a funeral home triggers a memory of your mother’s funeral—what it looked like, how you felt, etc. We all have Automatic Thoughts all the time. And most of the time we either don’t notice them at all or we’re only vaguely aware of them. When it comes to Cognitive Restructuring, it’s important to build the habit of becoming more aware of our automatic thoughts and really examining them closely. Step 4: Identify your emotional reaction and note how intense it is. Emotions are generated from our mental interpretations of things that happen. And the type and intensity of the emotions we experience depend almost entirely on the type of thinking we engage in. For example, using the example from above of being cut off while driving: If your thought is “What a Jerk,” you’re likely to feel angry. If your thought is “That son of a B%tch! What the hell is he thinking? !” you’re likely to feel an even stronger form of anger, perhaps bordering on rage. On the other hand, if your automatic thought was “Oh my God, he almost hit me! I’m going 70 miles an hour—I would have died!” You’re much more likely to experience something like fear or anxiety. Finally, your emotional response can contain more than just one emotion. If your automatic thought had been, “What a jerk! He almost hit me? !” You’d probably experience some mixture of anger and anxiety. In this case, it’s good to note both but typically there will be one that’s stronger or more dominant. Finally, for each emotion identified, rate how intense it was on a scale from 1-10. Step 5: Generate alternative thoughts. 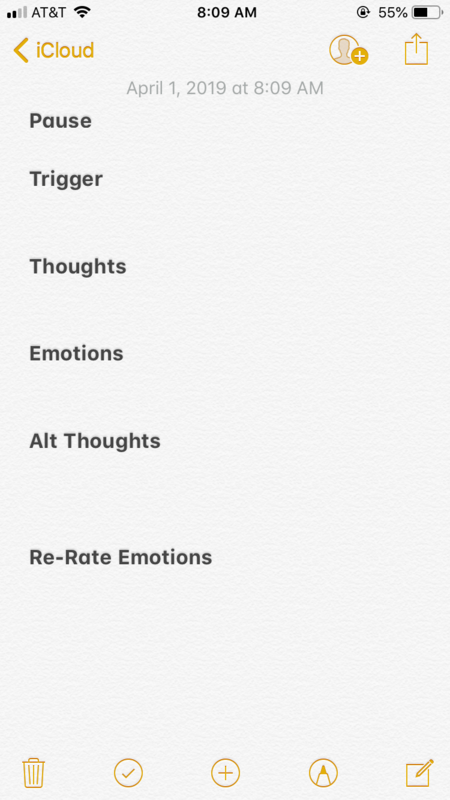 Once you’ve identified a trigger, noticed your Automatic Thoughts about that trigger, and taken note of your emotional reaction, the next step is to come up with alternative thoughts for each of your initial, Automatic Thoughts. In any case, the important thing is to simply be flexible and come up with more interpretations than your first automatic one. This practice creates mental flexibility, a key component in the ability to disengage from negative thinking patterns and overwhelming emotion. Also, in addition to simply generating more alternative interpretations or explanations of what happened, it can be useful to notice any obvious errors in your initial thoughts and develop alternative thoughts that are more realistic. For example, if you’re automatic thought was “Oh my God, he almost hit me! I would have died!” you might point out to yourself that “I would have died” is far from certain, even if he had hit you, and substitute a thought that contains something about how you’re a good driver and it’s very possible that you could have acted soon enough to prevent an accident. If possible, generate at least two or three alternative thoughts for each overly-negative Automatic Thought. Step 6: Re-rate the intensity of your emotional response. 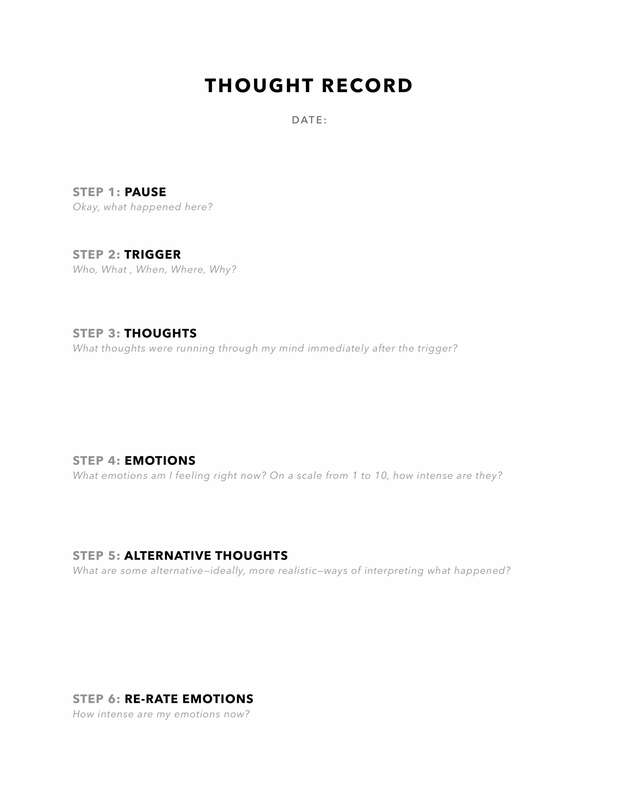 After generating multiple (hopefully more realistic) alternative thoughts, return to your emotion(s) you identified in Step 4 and reassess their intensity. Almost always, they will have gone down at least modestly as a function of questioning your automatic thoughts and generating alternative and more realistic ones. This final step is crucial because noticing and feeling the relief from your negative emotion decreasing is an important reinforcer of the new habit of Cognitive Restructuring. In other words, you’re much more likely to stick with it as a habit and benefit in the long-term if you get the reward of even slightly lower negative feeling as a result. The 6 steps mentioned above are a good overview of the elements of Cognitive Restructuring and how to do it in a general way. But when we’re first starting out, it’s helpful to have a specific template for guiding us through the steps. And that’s exactly what a Thought Record is for. A Thought Record simply a guide for walking you through the specific elements and steps of Cognitive Restructuring. You can click the image above to download a PDF version of the Thought Record template. If you’re just getting started with Cognitive Restructuring and Thought Records, I recommend the paper and pencil approach, at least in the beginning. Research shows that taking notes with Pen and paper leads to better encoding and memory for the subject matter, which is essential early on when you’re trying to learn the overall technique. However, the digital version on your phone is often more discreet, which can be nice if you want to quickly do some Cognitive Restructuring in a public place, for example. You can use a Thought Record any time you want to do Cognitive Restructuring. In the beginning, it’s usually best to always do your Cognitive Restructuring in the form of a Thought Record so that you can learn the process. Eventually, once you’ve had enough practice, you’ll be able to walk through the entire six steps in your head. No discussion of Cognitive Restructuring and Thoughts Records would be complete without some reference to Cognitive Distortions and the role they play in restructuring negative thinking patterns. Cognitive Distortions are unrealistic, exaggerated, and generally inaccurate forms of self-talk. And these habitual inaccuracies or distortions in the way we think tend to create distortions in how we feel—usually in the form of excessively strong negative emotions. “She’s gonna fire me, I know it.” This is what psychologists call Mind Reading, and it happens when we predict what someone else is thinking without any evidence of whether it’s true or not. “I totally screwed up that presentation…” This is called Magnification, and it’s what happens when we take an error or mistake and blow it out of proportion. In both cases, how we talked to ourselves was likely unrealistically negative. And as a result, we probably experienced a significant dose of negative emotion like fear, anxiety, or shame. Of course, we all play a little fast and loose with our self-talk sometimes. But if you’re consistently overreacting to things, there’s a good chance it’s because your habitual way of talking to yourself about things contains some Cognitive Distortions. To help you get better at recognizing and disputing your own Cognitive Distortions, here’s a list of the most common types of cognitive distortion followed be a brief description and example for each. Mind Reading means assuming we understand what other people are thinking without any evidence. Ultimately, Mind Reading is a failure of imagination — we only imagine the negative without considering other possibilities, some of which are bound to be neutral or even positive. Overgeneralization is when we extend the evidence for something beyond what is appropriate. Magnification is when we take our own errors or flaws and exaggerate them. Often magnification takes the form of catastrophizing small negative events and turning them into disasters in our minds. Minimization is the mirror image of Magnification and involves being dismissive of our strengths and positive qualities. When we minimize, it often keeps us in a cycle of feeling inferior because we don’t allow ourselves to benefit from acknowledging our true positive qualities and accomplishments. Emotional reasoning is when we make decisions based upon how we feel rather than what the evidence actually suggests. Black and white thinking is the tendency to evaluate things exclusively in terms of extreme categories. It shows up most commonly when we evaluate our own personal qualities and characteristics this way. Personalization is when we assume excessive amounts of responsibility, especially for things that are mostly or entirely outside our control. Fortune Telling is when we predict what will happen based on little or no real evidence. Instead, when our mind throws a negative outcome or worst case scenario at us, we “go with that” and tell ourselves that that’s what will happen. EXAMPLE: After a meeting, we predict, “They hated it!” (Mind Reading) and “There’s no way they’re going to accept our proposal.” (Fortune Telling). Labeling is when we describe ourselves or others in one extreme way, usually negatively. Because people and their sense of self (including our own) are highly complex and ever-changing, Labeling is always an inaccurate oversimplification. Should Statements are a kind of self-talk we often use to try and motivate ourselves by always saying what we should and should not do. When we’re in the habit of using Should Statements, we set up a false expectation that we should have more certainty than we do. This can lead to chronic frustration, anxiety, and resentment. EXAMPLE: “I just have to nail this performance,” we tell ourselves before going on stage. Cognitive distortions are good to keep in mind anytime you’re doing Cognitive Restructuring. In fact, some Thought Records actually have a specific place to note which Cognitive Distortions are present in your thoughts. If we can get better at recognizing these habitual ways that we distort our thinking, we’re much more likely to correct them, think more realistically, and as a result, not feel quite so bad. So far, we’ve covered what Cognitive Restructuring is, why it’s beneficial, and how to do it exactly, including how to use a Thought Record and identify Cognitive Distortions. But before we end this guide, it’s important to acknowledge that getting in the habit of actually doing Cognitive Restructuring is not easy. In part because many unanticipated but powerful obstacles often rise up and derail our best intentions. Here are the most common obstacles to Cognitive Restructuring that I’ve encountered in my work with clients, along with some thoughts for managing them effectively. On the one hand, it sounds obvious: For Cognitive Restructuring to be successful you must practice. And yet, I think it’s surprising how often we try new things expecting to get immediate results. The goal of Cognitive Restructuring is to fundamentally change the way we habitually interpret negative events in our mind. It’s a lofty goal. And while it’s completely doable, it does take practice and plenty of it. So set your expectations accordingly. Even if we understand that Cognitive Restructuring will take practice for it to be successful, there’s a related problem of remembering to practice in the first place. Despite our best intentions, new habits often fall by the wayside simply because we have no reliable way to remind ourselves to practice them. Remembering to do Cognitive Restructuring is a challenge because it’s not something we can just practice whenever we have a spare moment; instead, it’s best practiced immediately following an incident that leads to us becoming upset. To reverse engineer this problem, we might start with identifying things we do after becoming upset and see if we can’t use those things as a reminder to practice. For example, if you tend to text your spouse whenever something upsetting happens at work, you might ask your spouse to text you back with a reminder to do some Cognitive Restructuring. Or let’s say whenever you get into an argument with your spouse and get upset, you tend to disappear into your room and fiddle around on the computer. In that case, a sticky note on your laptop that says “Cognitive Restructuring” might help you remember. I pointed this out earlier, but it’s very important (borderline essential) that you not try to do Cognitive Restructuring in your head when you’re first starting out. The act of writing things down and referring to a Thought Record helps establish the basic knowledge and skills you need to complete it successfully. Doing your Cognitive Restructuring on paper (or digitally) has a second big benefit: it forces you to slow down. We can’t write/type nearly as fast as we can think. So when we force our thoughts down to the speed of writing, it often lowers the overall intensity of our feeling (Remember: the more negative thoughts you have the more negative feeling you’re going to experience). While spending too little time practice Cognitive Restructuring will obviously limit its usefulness, spending too much time on it can also be a problem. Many people spend far too long on their Cognitive Restructuring, agonizing over tiny details and being hyper-thorough. The problem is that such an approach isn’t sustainable and those who do go this route end up burning out quickly. A good rule of thumb is that Cognitive Restructuring should not take more than 5 or 10 minutes. At the very beginning, it may take a bit longer depending on the complexity of the situation and how familiar you are with the exercise, but in general, this should not be a time-intensive task. Instead, it should be surgical—accurate but concise! One of the biggest misconceptions about Cognitive Restructuring is that it’s “just positive thinking.” In fact, that’s not what it is at all. The overarching goal of Cognitive Restructuring is not to think more positively; it’s to think more realistically. Of course, if you’re habitually thinking in an unrealistically negative way, then yes, doing Cognitive Restructuring will lead to more positive thinking. But that’s simply a side effect of thinking more realistically. Many people instinctively feel that something as simple as changing the words you use to talk to yourself can have a significant and sustained effect on how you feel on a regular basis. And as a result, they dismiss it out of hand. My counter-argument is simple: What if you surrounded yourself with negative people who constantly berated you and put you down? Even if you knew they were wrong, the constant barrage of negativity would start to get to you. And ultimately, changing the type of people whom you hung around with (or somehow getting them to change how they spoke to you) would be the solution to not feeling so bad. Isn’t it bad to “fight” against my thoughts? Shouldn’t I just accept them? Maybe the most legitimate obstacle to Cognitive Restructuring is the idea that engaging with our negative self-talk—even if it’s in an attempt to make it more realistic—isn’t always a good idea. And actually, I think this is true. While Cognitive Restructuring is often helpful, it’s not the only way to deal with negative thinking and self-talk. In fact, for many of my own clients, I often recommend a more mindfulness-based approach that involves observing negative thoughts without engaging with them. The point is, Cognitive Restructuring is an approach—and often a powerful one—but we should acknowledge that there are other approaches that may be equally or even more effective depending on the context. As a way to tie this guide together, I wanted to offer a practical, real-world example of how Cognitive Restructuring actually looks. The following example came from my own work with one of my former clients. Julie was a client of mine who had struggled with chronic—and sometimes severe—worry and anxiety. 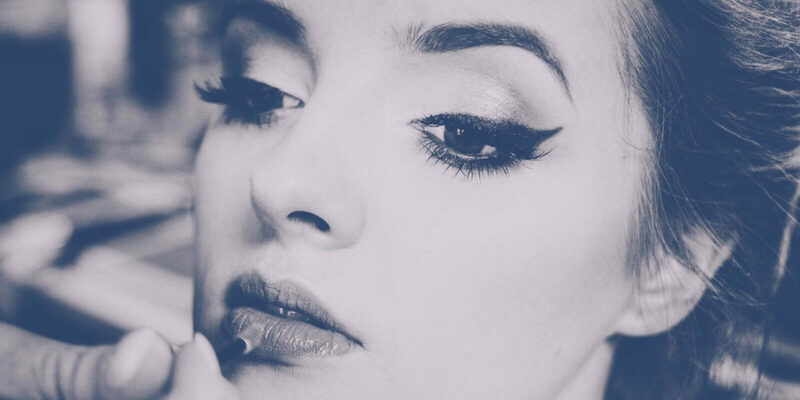 I remember the day I met her, Julie described how she felt like her mind was her own worst enemy, constantly attacking her with negative, worst-case-scenario thoughts about herself and her future. What if Abbey (her daughter) gets in a wreck on the way to school? I might never see her again. Why can’t I get my mind to stop all these negative thoughts? What’s wrong with me? What if it gets so bad that I lose touch with reality and just go crazy? She thinks I’m anxious. I bet that’s why she didn’t smile when I walked in. I always screw up interviews. This is going to be a disaster. I’ll never get the job. Needless to say, with a near-constant stream of negative thinking like this going on in her mind, Julie was extremely anxious. After describing what Cognitive Restructuring was and what it looked like, I asked Julie where she thought it would be most useful in her life. After thinking briefly, she explained that she had the most severe worry and anxiety whenever she had to interact with her mother-in-law who she found to be a very negative, judgmental, and difficult person to get along with. This was an especially big problem for Julie because her in-laws lived in the same neighborhood and she was constantly seeing them. For Julie, the worst part was the hour or so before she had to interact with her mother-in-law. What if she asks me about my job again? I’ll probably stick my foot in my mouth as usual and come across as an even bigger airhead. I don’t know what to wear? She’s always dressed so well and I never look put together. I’m sure she thinks I’m a complete mess. What if I get so anxious that I start getting stomach issues? I don’t want her to see me going to the bathroom dozens of times. What if I can’t wait and I lose control…? The first thing I encouraged Julie to do was make a plan for remembering to do her Cognitive Restructuring during these high anxiety times before a visit with the mother-in-law. Because her husband was usually with her on visits like this, she asked him to help remind her to do it if she seemed anxious. Next, we reviewed her plan for using a Thought Record. She preferred the pen and paper version, and I suggested she make a bunch of copies and keep them in her house and car so that she’d always have some available and close by. When Julie came back to see me one session after a visit with her mother-in-law we talked about how it went doing Cognitive Restructuring. She explained that at first it was hard to even get started because she was so anxious. She even found herself worrying that she wasn’t doing it right and that it wouldn’t work. I reassured her that that was a completely normal response—literally everybody worries that they’re not doing it right the first few times! Next, she described how she had remembered to pause and check in with herself (Step 1) before leaving for her in-laws. For her, the feeling of anxiety was a good cue and reminder to begin Cognitive Restructuring. After that, she walked through how she tried but struggled to identify the trigger for her worry (Step 2). After working our way backward from a point when she knew for sure that she was anxious, we discovered that her worry first started after her husband asked what color shirt she liked better for their dinner at his parent’s house. The next step of identifying her negative automatic thoughts (Step 3) was even more difficult she explained, mostly because they were going so fast and she was also thinking about all the things she still needed to do to get ready. But, she explained that once she started writing down a few thoughts, she felt her thinking noticeably slow down, which was a relief. She went on to explain that the thought that kept coming up was: It’s going to be miserable. She even explained that she was able to identify the Cognitive Distortion of Fortune Telling—predicting the future without any substantial evidence. Next, she identified anxiety as her dominant emotion and rated it as a 7 out of 10 (Step 4). Julie then told me how the next step in the process was the hardest part—generating alternative thoughts (Step 5). For a while, her mind just felt blank. But as she sat with it, she realized that her initial though—It’s going to be miserable—was an overgeneralization in addition to fortune telling. She was assuming that every aspect of the visit was going to be miserable. But in reality, she realized, there were parts of it that were not and that she even enjoyed (her father-in-law was very funny and good-natured, and the food was always excellent at her in-laws). Having to interact with Sharon (the mother-in-law) will probably be rough, but it’s always fun chatting with Bruce (the father-in-law). Tim (her husband) mentioned that we were having ravioli for dinner, which I love. I’m usually more anxious anticipating the visit than the visit itself. Finally, Julie thought about her anxiety. And while it was still there, it was a little bit lower (5.5 out of 10). And even though she still felt anxious, she remembered feeling encouraged by the fact that it had worked, even a little. One of the most important points about getting started with Cognitive Restructuring is that you start small. Julie didn’t just try to do Cognitive Restructuring everywhere, all the time. Instead, she picked a particular area in which she struggled and worked on it there first. Julie was experimental. When she first tried her Cognitive Restructuring, there were multiple moments of doubt and confusion. The important thing was that she stuck with it and just did something. Even though she didn’t need it, she had a plan for remembering to do her Cognitive Restructuring in the first place. Julie discovered that she didn’t have to have all her anxiety go away to find the exercise helpful. The confidence that came from learning that she could start to make a positive difference in her self-talk and negative thinking was huge for her, even if her anxiety reduction was fairly modest. Cognitive Restructuring is a powerful technique for reducing negative thinking patterns and whatever stress, anxiety, or other negative emotions and moods they create. By learning to practice identifying and restructuring these habitual ways of thinking, we can not only start to feel better in the moment, but in the long-run, we can train our minds to think about the world in a more realistic and balanced way. Cognitive Restructuring is a core technique from Cognitive Behavioral Therapy, the most research-supported approach to treating common emotional struggles such as anxiety and depression. Cognitive Restructuring helps us to identify overly-negative habits of thinking which lead to overly-negative mood states. By changing our automatic thoughts to be more realistic, we can change how we feel on a regular basis for the better. Cognitive Restructuring has many practical benefits from lower anxiety and stress to improved communication, less procrastination, and more confidence. Identify your emotional reaction and how intense it is. Re-rate the intensity of your emotions. A Thought Record is a practical template for doing a Cognitive Restructuring that’s especially useful for beginners still learning the process. Cognitive Distortions are unrealistic and exaggerated ways of thinking that lead to negative self-talk and overly-negative emotions and moods. They include: mind reading, overgeneralization, magnification, minimization, emotional reasoning, black & white thinking, personalization, fortune telling, labeling, and should statements. It’s essential to understand that the power and benefit of Cognitive Restructuring come from the consistent practice of doing it. This is a pretty big guide with a lot of information. Was there part of it that you found most helpful? Or confusing? Please let me know those and any other thoughts, questions, or reactions in the comments below! I really enjoyed this guide. I found all of it very clear and easy to follow. 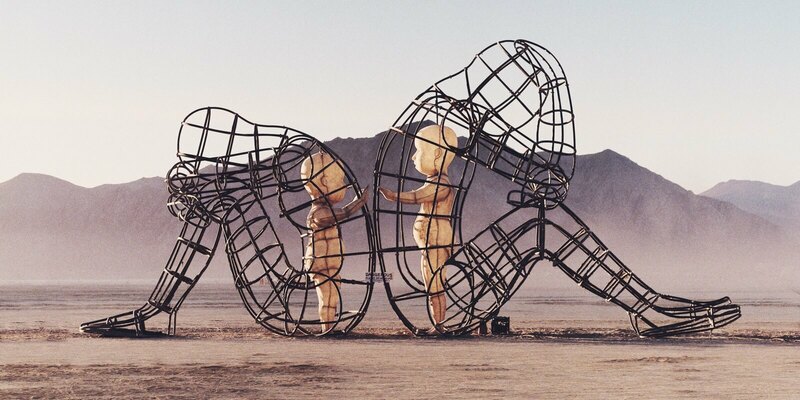 Understanding this process will be very useful for myself and others.I mentor people in recovery and most of us are, or have been, plagued with negative self-talk.We often indulge in substance abuse because of our negative self-views and those certainly they develop and grow bigger as a result. Thank you so much for this valuable resource. Thanks, Roz. So glad it was helpful! Please keep me posted. I don’t work with substance abuse much but I’m intrigued as to how this may be helpful. I found the artificial is very useful. This is so clear and well written. I have passed it on to many people and use it all the time. I love to hear you write more about kind-postive-gentle self talk as a habit to cultivate. There is so much out there about daily gratitude lists and/or affirmations which is a great. Though I suspect kind-postive-gentle self talk is a practice that many could benefit from. Thanks for your newsletter.